Out in Bearkat Plaza, hip-hop music regularly blasts, its deep beats pulsating through crowds of students. Campus isn’t the only place its influence reaches—it can be heard in cars and through the headphones of passing students around town, on TV and in bars. Its presence is everywhere. What he means is something he has been exploring in a collaborative research project with doctoral candidate Kevin Steinmetz that examines how hip-hop can be used as a resource for criminology. Their ongoing research has shown hip-hop has strong lyrical messages that can help law enforcement and lawmakers understand why the relationship between criminals and law enforcement is sometimes negative and how it can be improved. In addition, through the lyrics, Henderson and Steinmetz found that rappers tell us certain things about their culture, crime rates, and their relationships with each other. By using this information as a resource, Steinmetz feels that the criminal justice system can ultimately make better policies. The two have been studying the effects of a specific criminology theory called the legitimacy theory, which posits that people’s belief in the legitimacy of the law leads to a greater inclination to obey the law. “People don’t have to agree with the laws but they have to find them to be fair. If criminals are treated with fairness and respect, then the theory finds that they are more likely to give you legitimacy,” Steinmetz said. “Thus, if someone is arrested but is treated fairly, they are more likely to cooperate because they feel respected. When Henderson and Steinmetz began researching hip-hop, they found that no one had ever looked at music as a way to answer those questions in an academic setting. For the project, Henderson and Steinmetz conducted a nine-month project, for which they listened to the top 100 hip-hop songs over the last 10 years, noting what they heard. 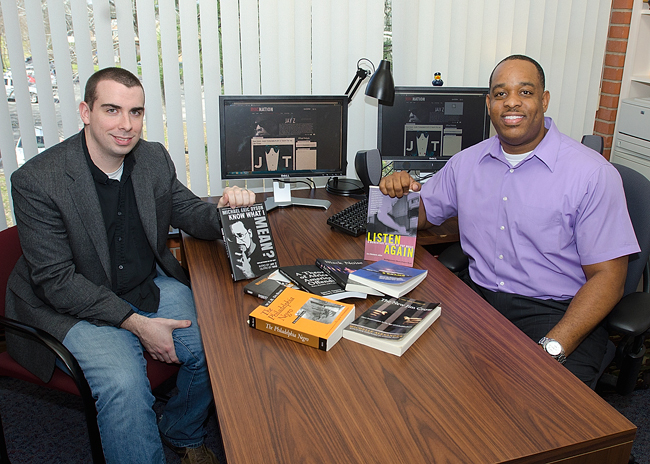 The project was funded as a summer doctoral research fellowship for Steinmetz through the College of Criminal Justice and resulted in an article entitled “Hip-hop and procedural justice: Hip-hop artists' perceptions of criminal justice” that was published last year in Race and Justice, the official journal of The American Society of Criminology’s Division on People of Color and Crime. In their work, the two examined the music based on three specific observations and the subsequent questions that arose from them. First, if the street culture of hip-hop is so readily evaluated in criminal justice, what information could be gathered from the music? Second, if hip-hop is an unexplored area of research, why is it important? Third, does the lyrical content match what they know by way of public sentiment surveys? What researchers weren’t listening to, Henderson said, is that the music reveals much more about hip-hop culture than the stereotype usually indicates about it. In examining hip-hop in this way, they found the music could be used as a resource to create better laws that are specific to the varying cultural environments of hip-hop. Steinmetz noted that he gained a newfound knowledge of what he calls a “myriad of new cultural understandings” about hip-hop—a knowledge that emphasizes that actually listening to the music is one of the most important and revealing aspects of their research. In listening to the music from an evaluative perspective, two distinct groups emerged. Part of this, Henderson said, is because the audience has also changed with the artists. “Jay-Z’s listenership has aged with him,” Henderson said. “Part of it is that artists recognize that if they go back and talk about that very animalistic behavior, their listeners are going to say, ‘hey listen, this is not what I want to hear,’ and they’re going to go somewhere else. The second section of hip-hop is a specific group of newer rappers who have always been socially conscious. “They rap about education and doing the right thing, and they’re separate from the other group who is rapping about these things because they have matured away from drug selling and into social issues,” Henderson said. “The hip-hop community is interesting because they are quick to call a sell-out. The gangsters say if you aren’t writing about gang activity, then you’re not being real. It’s a hard knock life? Henderson said their project aimed to ask if the music is really a reflection of what is going on. As an art form, hip-hop has evolved from neighborhood kids talking about what they see happening at home and in their neighborhoods to a place where now practically everyone—regardless of background or skin color—has listened to hip-hop. On the other hand, Henderson said they wondered why hip-hop is so popular with groups of varying backgrounds across the board. They feel the answer lies with the “drama” aspect of hip-hop. Their study also examined ideas about gender roles, female empowerment, tone of the music, and other culture-specific behaviors—factors that contribute to understanding hip-hop better—which Henderson believes is the first step toward making more effective laws or using the music to fight street crime. “A lot of the lyrical content had to be interpreted with the intended tone of the music,” Henderson said. “A lot of it is actually metaphorical and not from personal experience. If the content was violent, it tended to be retaliation; not inherently violent. Henderson said that studying and understanding these things ultimately could change the structure of future laws, as well as the way lawmakers and rappers, whether they are from the streets or not, interact with each other. When the cultural stereotypes and assumptions about a culture are dropped in favor of genuinely trying to understand each other and what is really meant by their music and why it is that way, Henderson said, the disconnect between each is vastly smaller. Steinmetz said they feel their research is so significant that they are working on a second article with an editor from The Journal of Criminal Justice and Popular Culture. Their second article will be based on their original data, but will examine how hip-hop explains the criminality of the music artists or others.